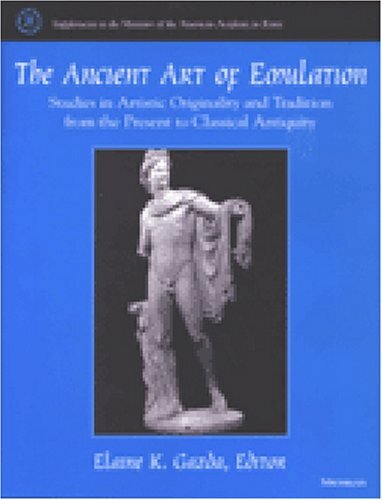 [PDF] The Ancient Art of Emulation: Studies in Artistic Originality and Tradition from the Present to Classical Antiquity (Supplements to the Memoirs of the American Academy in Rome) | Free eBooks Download - EBOOKEE! Description: This volume of essays examines the question of copying and other forms of artistic imitation and emulation in relation to Greek and Roman art, focusing particularly on sculpture and painting in the Roman period. It goes beyond recent studies of the subject in bringing to bear the views of early modern, modern, and contemporary artists on matters of copying and imitation as well as an exceptionally wide array of traditional and current critical perspectives historiographic, literary, technical, stylistic, iconographic, and museological, among others. Long regarded as copies of lost Greek masterpieces, a great many Roman works are now seen as neoclassical images worthy of analysis within their own Roman contexts. This book identifies and takes account of Roman criteria in rethinking the function and aesthetic appeal of these works in the eyes of their Roman owners and audiences. Collectively, the essays argue that many traditional assumptions about the status of works of classical art as originals or copies, and much of the evidence that has been used to sustain these assumptions, must be thoroughly rethought. Among the authors are classical archaeologists, art historians (whose areas of expertise range from antiquity to the nineteenth century), and a contemporary artist and critic. Elaine K. Gazda is Professor in the Department of the History of Art and the Interdepartmental Program in Classical Art and Archaeology, University of Michigan. No comments for "[PDF] The Ancient Art of Emulation: Studies in Artistic Originality and Tradition from the Present to Classical Antiquity (Supplements to the Memoirs of the American Academy in Rome)".